To learn more about the program click! on its name above! You can be included among those grads who have sent us copies of their Business Cards by email or send us newsbriefs using email by sending it to ADavidhazy at andpph@rit.edu. VGrads visit and give presentations and TPSA shows a flick and DINNER OUT! 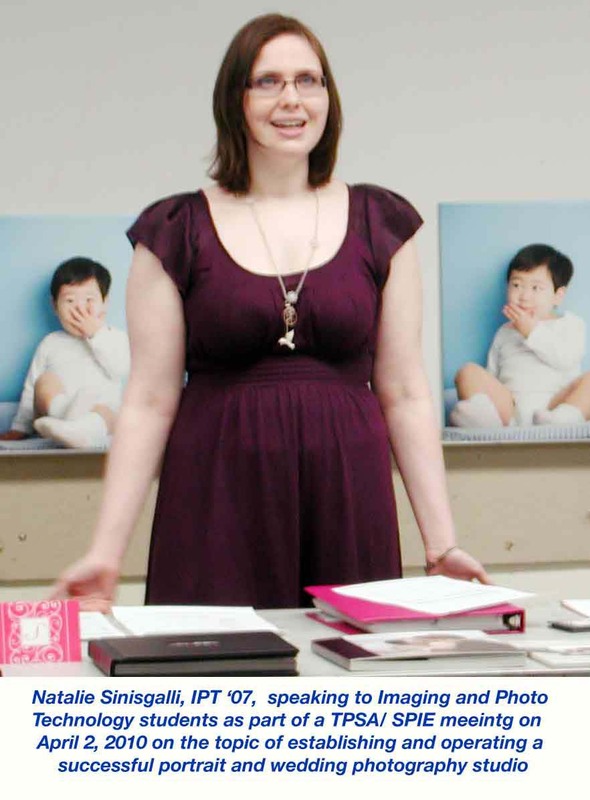 Natalie Sinisgalli, who is ruinning a very successful portrait, wedding and social photography business came in on a Fridaty afternoon and met with curent stdunts discussing the methods and approaches for successful wedding photography. 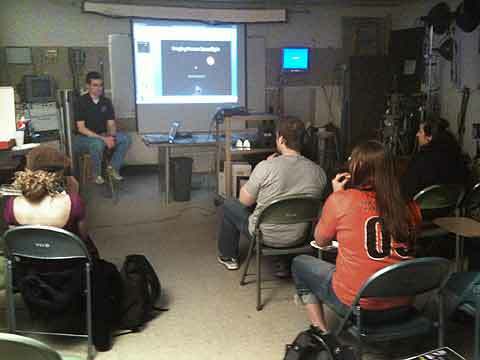 Paul Reichert, was on a business trip to Rochester from Johnson Space Center and he came to the high speed lab to meet with current student and to present some of the activities that he is involved with as trainer of astronauts in the area of still and video photography. 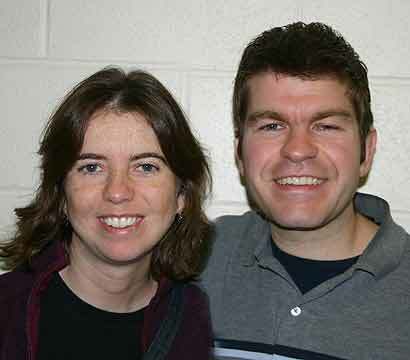 The contributions of these two grads to the "education" of current students is much appreciated. Any other grads out there that pass by and could spend some time here would be MOST welcome. Free lunch people! 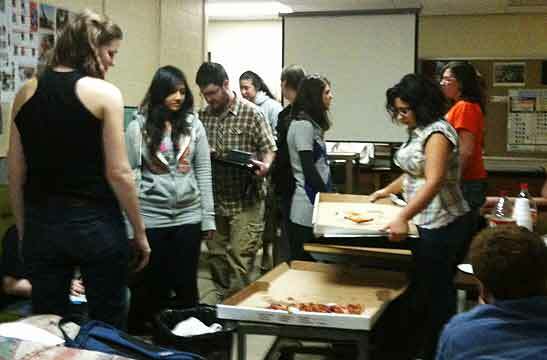 In addition, on Friday the 2nd, 2010, the Technical Photography Student Association and the joint student chapter of SPIE held a "movie night". Great turnout but the name of the flick has been forgotten by this reporter ... as well as the story line! 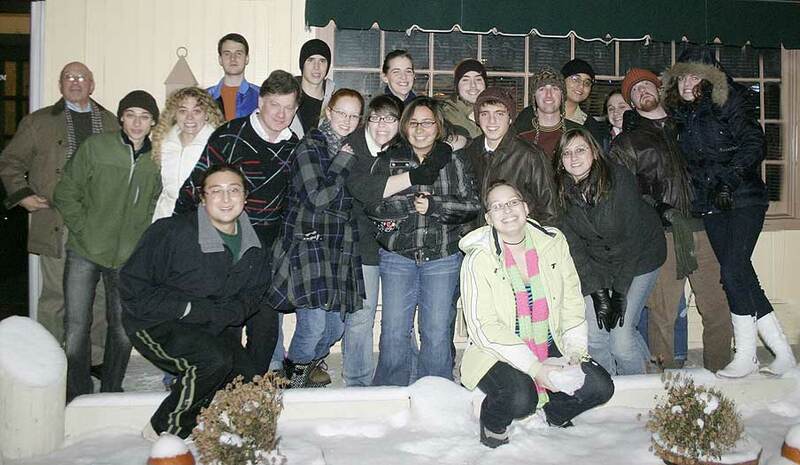 On April 9, 2010 Tech students went out to dinner for Italian fare as in past few years. There is a set of underexposed iPhone photos from the event as well HERE! 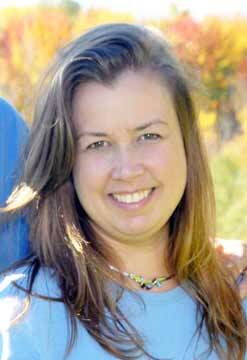 Michelle (HIll) Perham, dropped in recently with he husband Ryan. 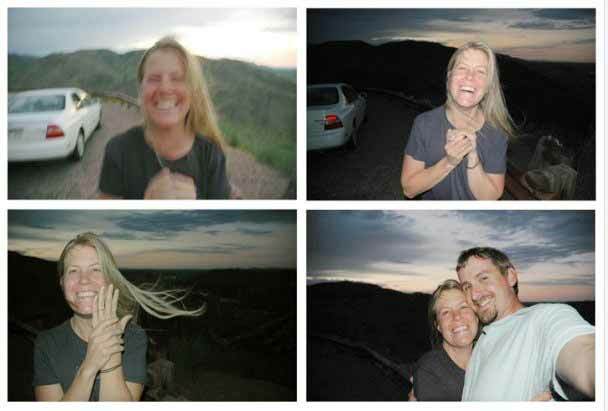 They have a distinct achievement to share in that they were married on Mt. Rainier. Additionally, Michele is expecting in early July! Congratulations! 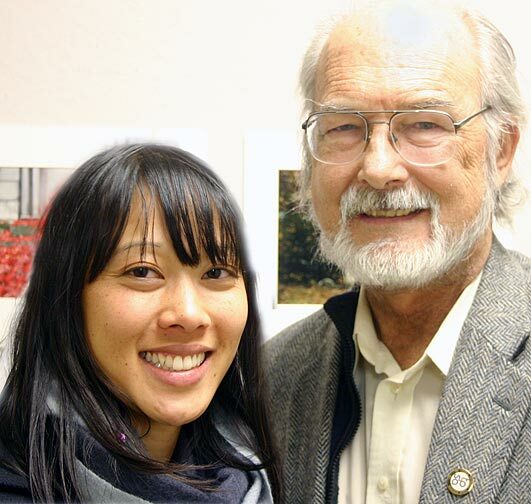 Linda K. Le, dropped in during a visit to Roicjhester on business but she wanted to check out her undergraduate environs. 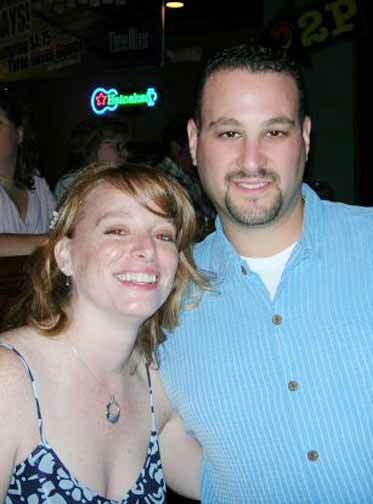 Marci (Fingeret) Heitner, is enjoying life on the west side of Orlando with her husband Eric. They have the most adorable Boston Terrier named Bailey. David Murphy, sent a brief message. 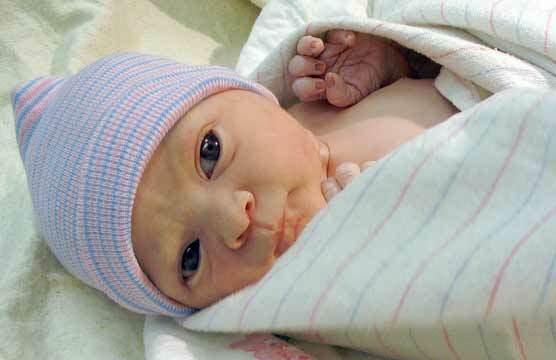 It goes like this: Stella Rose Murphy born March 9th at 10:30pm, 6 lbs. 12 oz., 20 inches. Stella & Jen are doing wonderful! We love our little girl so much, she is beauitful!!! 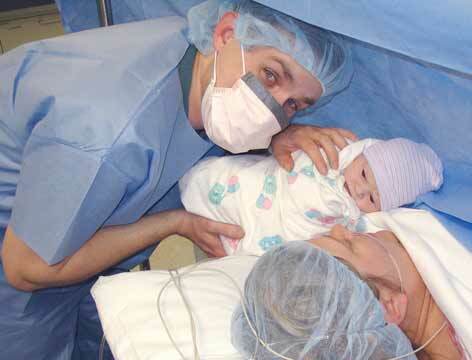 Bret Harmen, also has news of a new arrival to annouince; Lauren Alyssa Harmen b. 3/3/10 19" 8.1 lb. everyone healthy. Bret is a man of few words. Congratulations!! 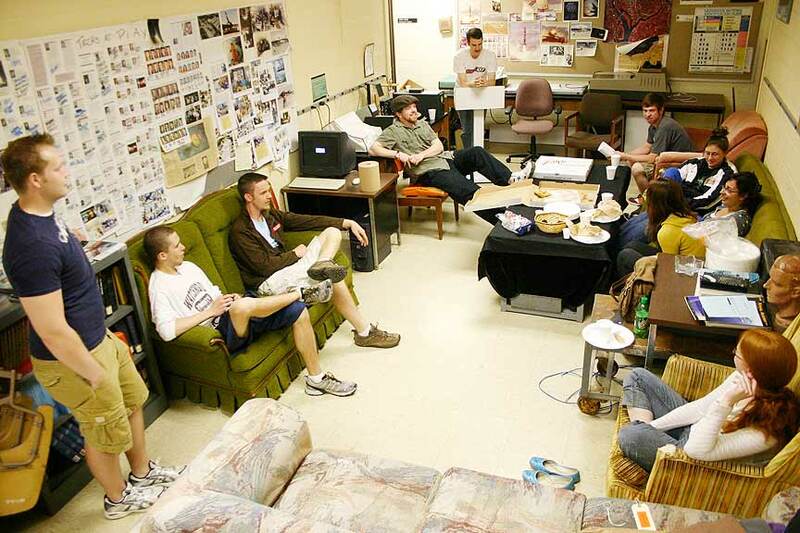 After 20 years of murturing it, Andrew Davidhazy is no longer the chair of the Imaging and Photo Technology program. Karen (Punis) Marks, 1991, dropped in to say hello during Brick City homecoming at RIT on the weekend of October 10, 2009. 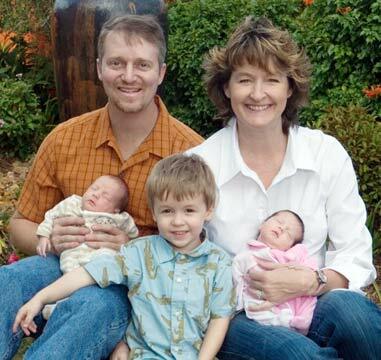 She is enjoying life and her family with husband Chris and sons River and Canyon. River is already planning to design a better Wii game and wants his own compiler! She says she had a great corporate experience but that she is enjoying being a mom and domestic engineer and substitute teacher. 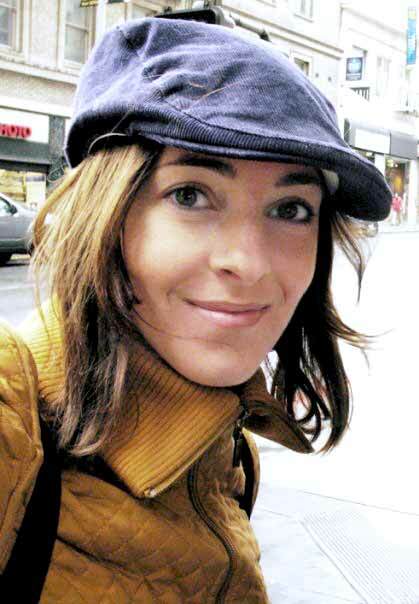 Alicia Novi, 2002. whizzed by here as well and we had a chence to make a picture almost "on the run". Alicia went on to a law career but says that the techical and science courses she took as part of the program made is much easier to pursue her law graduate program. 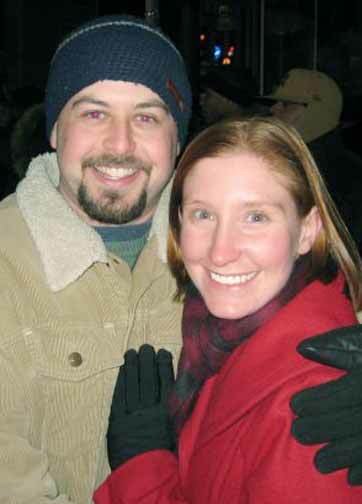 As Saturday was drawing to a close John Coleman, 2009, and his finacee, Lori Duprey, ambled in from other homecoming activities and related that they will be married this coming May. He is enjoying his work at Filmetrics here in Rochester and she is starting her own photo business. Greg Schrider happened by on his way to Toronto to deliver some of his company's products. He is the VP of Sales for BYK-Gardenr (manufactrurer of many types of color related instruments) in Columbia, MD and living now in Mt. Airy nearby. 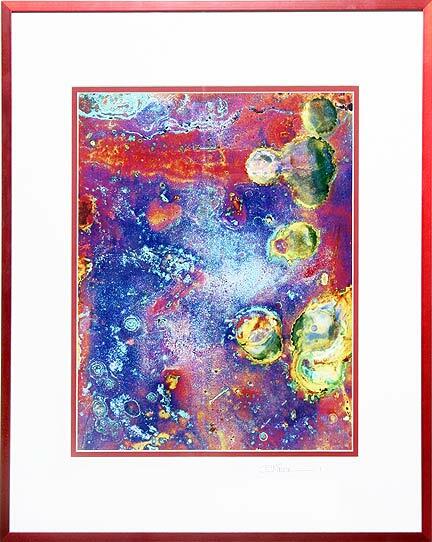 Rick Behrens recently had an extraspatial experience. Here he tells about it: "There are few things I've wanted to do since I was a kid. I've wanted to see a shuttle launch since my first visit to Kennedy Space Center in 1979 - two years before Columbia's first flight. With only a six flights remaining in the Shuttle program, I finally got to see one take off. Quite a spectacle! 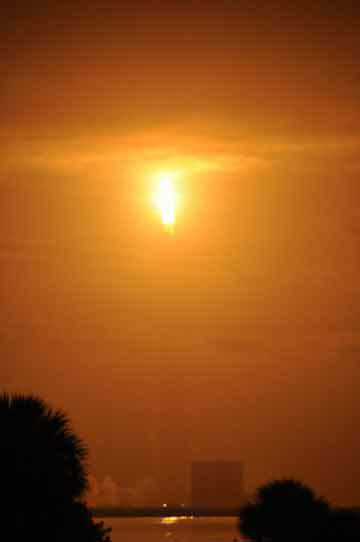 This shot was taken at 1 min 13 sec from launch (12:01 this morning). Rick"
And a very brief message arrived from Ian Grob from out there in Montana. Something about Dana. Guess what it was about. See middle photo! 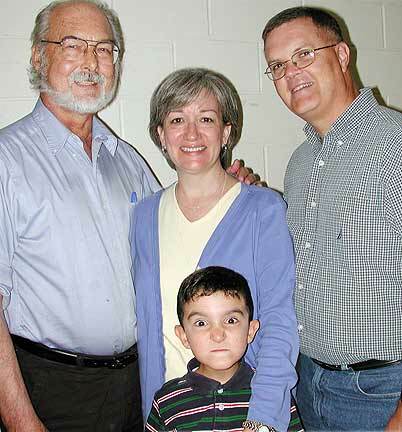 On August 28, 2009 Nan (Judge) Headrick who graduated from the program in 1991 returned for a whirlwind visit and brought her family along and toured the Institute marveling at all the new buildings, programs, and landscaping. She was quite impressed by the changes. Nan was the prime mover and shaker behind the TPSA in those years and organized several very successful mini-trade shows on campus that to this date have not been duplicated by any other group. She was accompanied by her husband Tone who works with the Navy and her son Aaron who is now 7 and a most inquisitive and active young man. Obviously not camera shy and delights in posing for group photos! Nan is doing home-schooling with Aaron and enjoying every minute of it. Her plans for the future include a possible visit to Kennedy Space Center to witness a launch of the Space Shuttle before the program is discontinued. 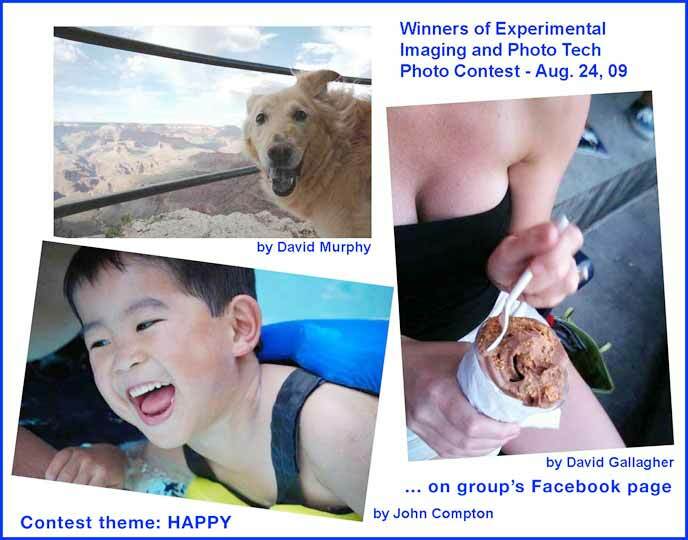 This is a bit about an experimental photo contest just for members of the Imaging and Photo technology group on Facebook on the theme of HAPPY or HAPPINESS. 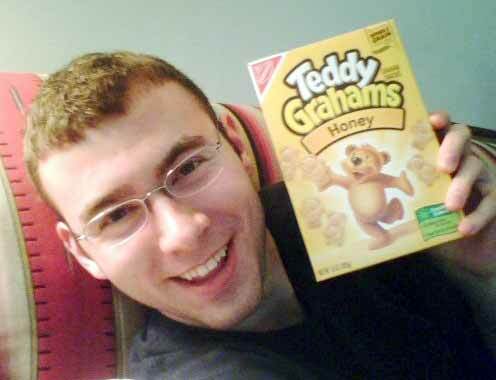 The other grad, David Gallagher, graduated many moons ago. Like in 1991. 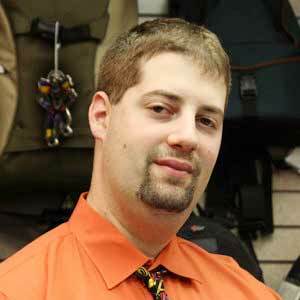 He is living and working in the Atlanta area and is a successful distributor of high end digital cameras. 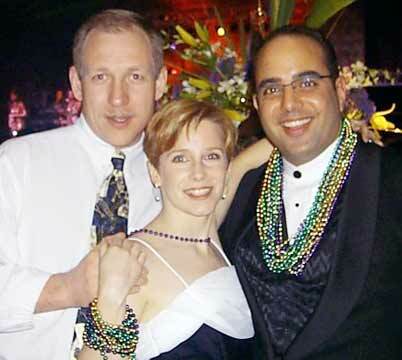 He recently married and is happy as a clam and his family can be in Atlanta. Now the third winner among the top three is Prof. John Compton, who helped Drs. Zakia and Stroebel and Prof. Current put together the previous edition of the Materials and Processes of Photography book. John became an efficiency expert in the Graphic Arts industry and has been doing independent consulting in this area for maybe 20 years now. Finally, by selecting the fourth thumbnail you can get to see their winning photograph. CONGRATULATIONS to you all and if you are not a member of the Imaging and Photographic Technology group on Facebook you might consider it. Chelsea McCulley dropped in to check things out and relayed that she is looking forward to several interviews related to her new love: microscopes. John Coleman stopped by today, the 18th, with a big grin on his face. 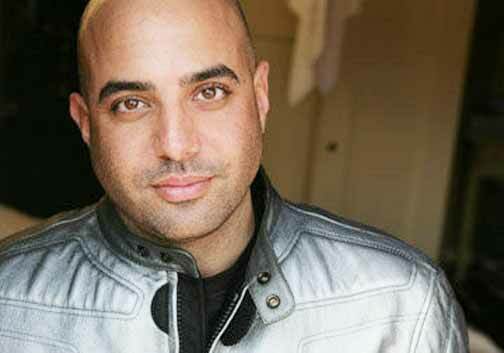 He is now working for Filmetrics along with Jarrett. News from the rest of the Tech crew will be shared as they become available. Note that now the Tech Department is also established as a group on Facebook. Take me to the Facebook site! 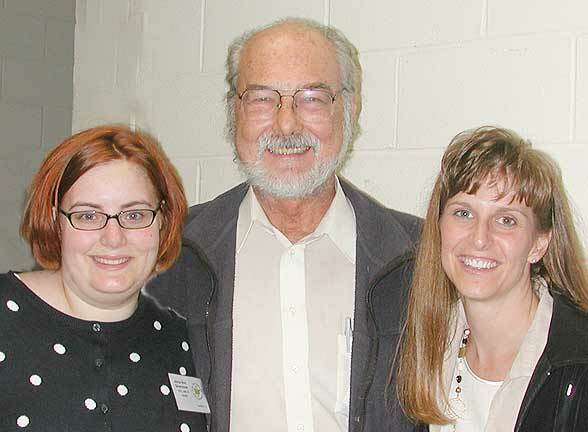 There was a special event at RIT and the School of Photographic Arts and Sciences on saturday July 25, 2009. It is called College and Careers day and it is a program designed to bring possible future students to RIT and give them a hands-on experience living in the dorms and exploring 4 possible career fields by participating in seminars and workshops presented by faculty. 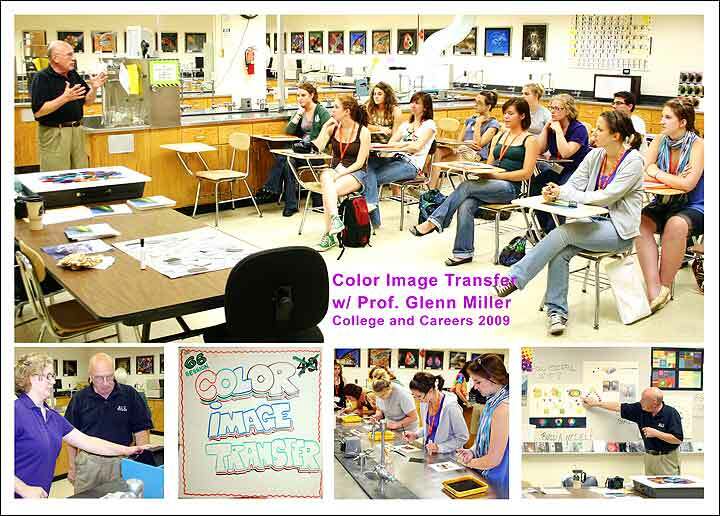 The imaging and Photographic Technology faculty rose to the occasion and three of them presented several of these seminars. 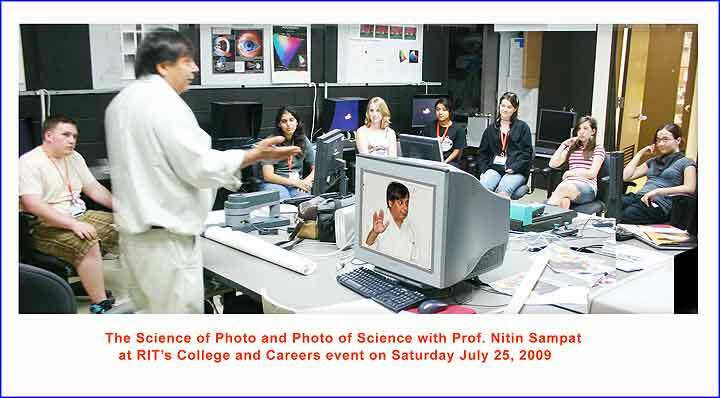 The Photo of Science and Science of Photo (Sampat), Color Image Transfer (Miller), and High speed photography (Davidhazy) were the titles of the seminars and the participants came from all over the nation. 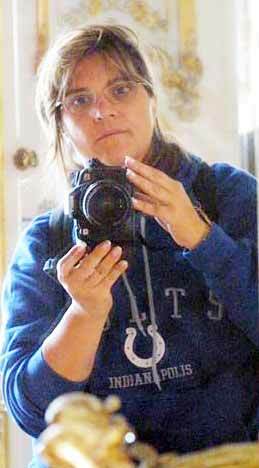 During a dry spell in Rochester and while exploring Facebook where the Imaging and Photographic Technolgy program has a presence the following graduates from years long past and some from more recent times were "found" and their profile photos added here. 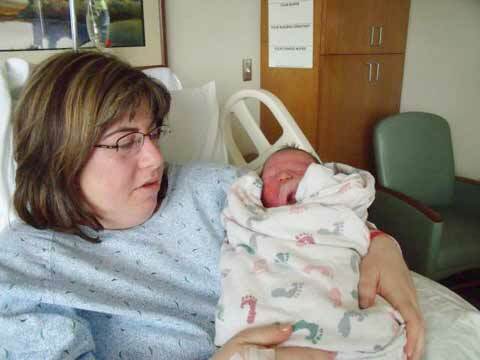 (If anyone wants their photo removed let ADavidhazy know) Marci Fingeret Heutner, Julie Fox, Dan Axelrad, Katelyn Kern, Becky Sharp, Iris Sprow, Mary Webb, Jarrett Whetstone, Scott Bogart, Bret Harmen, Laurel W. Mielkarski, Steve Marchiando, Meredith P. Stozner and Bill Stotzner, Meredith and Dan Axelrad plus Lisa deBettencourt, Jessica Scott, Sara Arnold and Lindsay Sargeant If you'd like to get in touch with any of these classmates check them out on Facebook or write to Andy who may be able to help making the connection! Liana Schuetz and family visit, Akira Hasegawa and Chris Wong drop by, Melanie Niles, Carl Teger, David Gallager and Bruce Butkus send photographs! 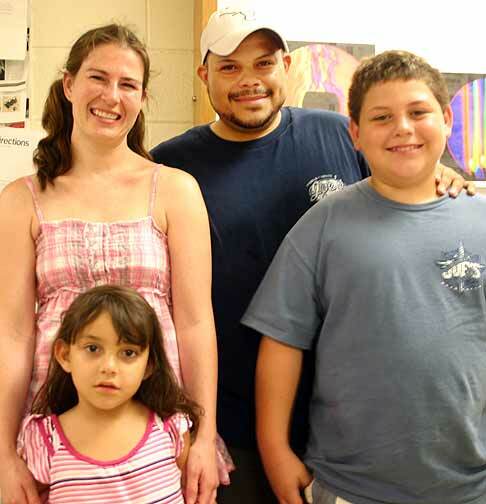 Liana Schuetz dropped in to Tech Alley with her family towards the end of June 2009. 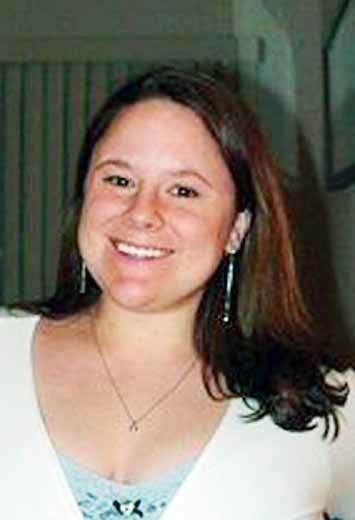 She is now located in Texas and after going back to school she is now working as a dietitian. Akira Hasegawa also came by and related that things are going well although the Japanese financial situation is also stressed. His Computer Education school is doing well. 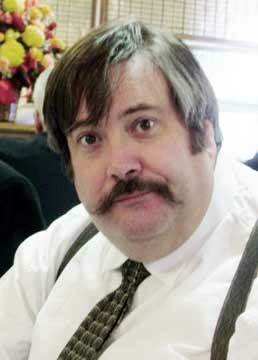 He is trying to get in touch with Jennifer Rossler. 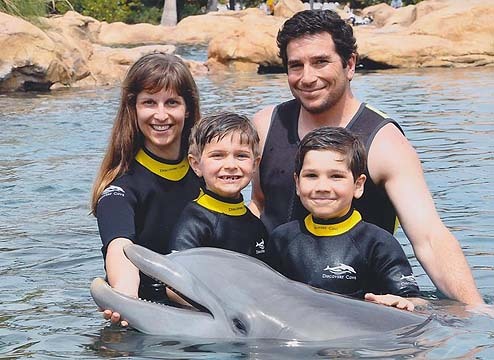 Melanie (Krisantz) Niles sent an announcement of a possible opening at EFI and along with it she sent a photograph of her family, Mike, Samantha and Sydney. 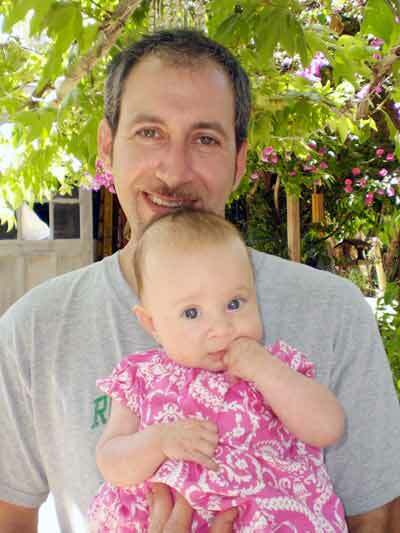 Carl Teger sent this photograph of him with his 4 month old daughter Ruby Ann. A charmer!! And Dave Gallager sent a very brief update with the photograph of his new family group now comprised of 5. 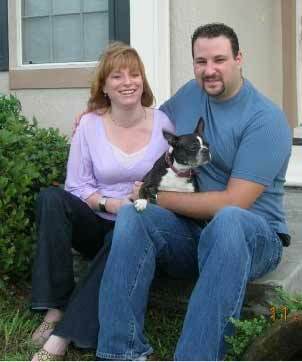 He says: "Happily remarried and increased the size to 5! Opened a second office in South Beach last year. And looking for a salesman in the So. Florida area!" 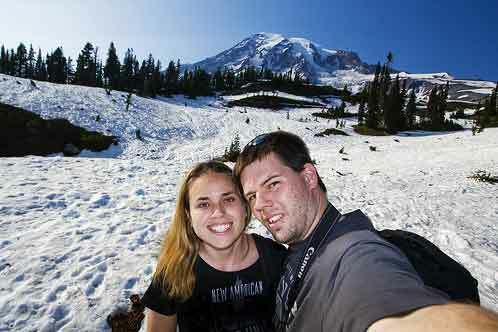 Bruce Butkus and Kristin Castenschiold just complketed a tour of the Pacific Northwest and put up their photogrpahs on Facebook where you can take a look at them and at least vicariously enjoy the magnificent scenery of the area. These are Bruce's and these are Kritin's. 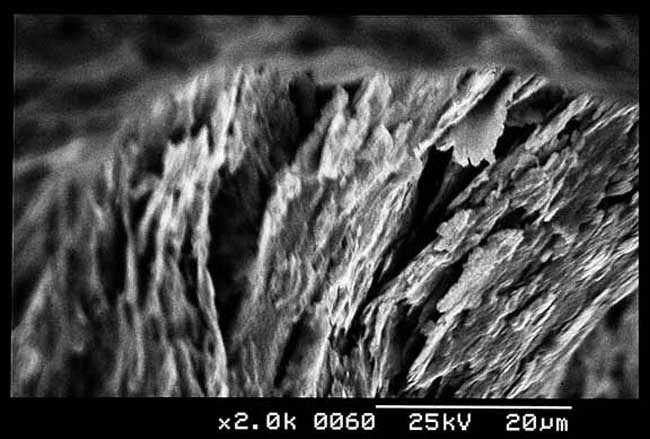 Chelsea McCulley took the Scanning Electron Microscopy course with Don Drake this past quarter and she made some stunning SEMs. 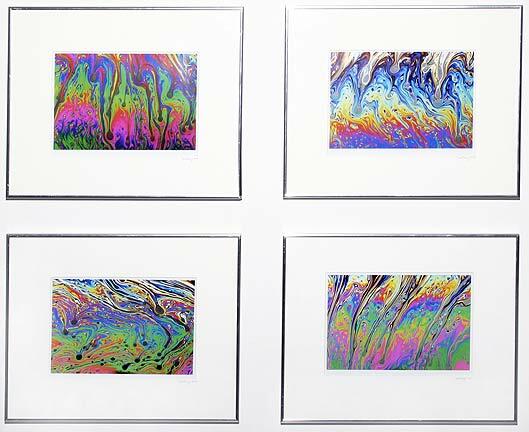 In one case she made a series of images of the same object at different magnifications and ended up assembling the set and asking the question: What is it?. To find out follow this link to the answer! On May 23, 2009 graduation ceremonies were held at the Gordon Field House. Graduating seniors assembled there and immediately oroceeded to embark on the festivities associated with such a momentous occasion. As you can see they were the picture of seriousness and decorum. NOT! The graduates relished every moment of the ceremony and made sure that it would live in their memory for years to come. Chelsea, Shane, Jessica, Eric, Eric, Brian, Chris, Cassie and Jon were joined by members of the department of Imaging and Photographic Technology (DIPT) faculty, Profs. Glenn Miller, Nanette Salvaggio and Andrew Davidhazy. 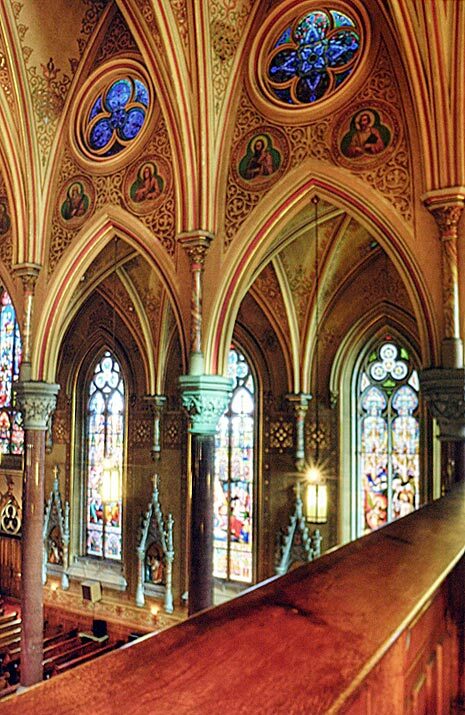 Visit at small gallery of snaps taken by Nanette Salvaggio by CLICKING HERE! Mote that the department has a presence on Facebook and you are invited to join the group. Click HERE to get to it!. Also, in addition to the photograph of the brochure the graduates put together, and shown above right as a JPEG, you can obtain it as a PDF document suitable for printing by clicking GET PDF of GRAD S Brochure! C O N G R A T U L A T I O N S G R A D U A T E S O F 2 0 0 9 ! These three photographs comprise a sampling of an Imaging and Photographic Technology 1 Spring 2008-2009 class exhibition installed in the display cases of the School of Photographic Arts and Sciences by freshmen students. 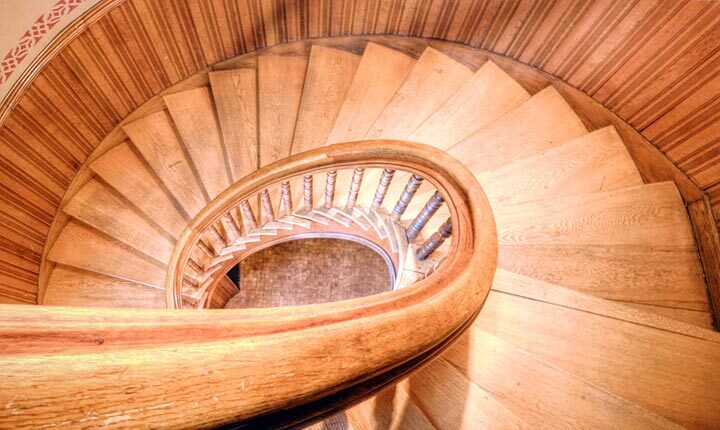 Their photographs were the result of an Interior Architecture Assignment by adjunct professor Don Cochran If you would like to see the complete collection Select This Link to visit the online gallery of the exhibition. On April 31, 2009 the Technical Photography Student Association (TPSA) and the joint chapter of the SPIE met in Tech Alley to elect new officers for the coming year and to congratulate and thank Eric Evans, president for the last two years for a fantastic job of coordinating the club's activities. The new officers are: President: Brian Zazcek, Vice-president: Robert Crawford, Treasurer: Kristin Pelc-Pacheco, Secretary: Nino Gordeladze, Webmaster: Jonathan Damian Thank you again, Eric and best wishes to the new officers for a successful year next year! 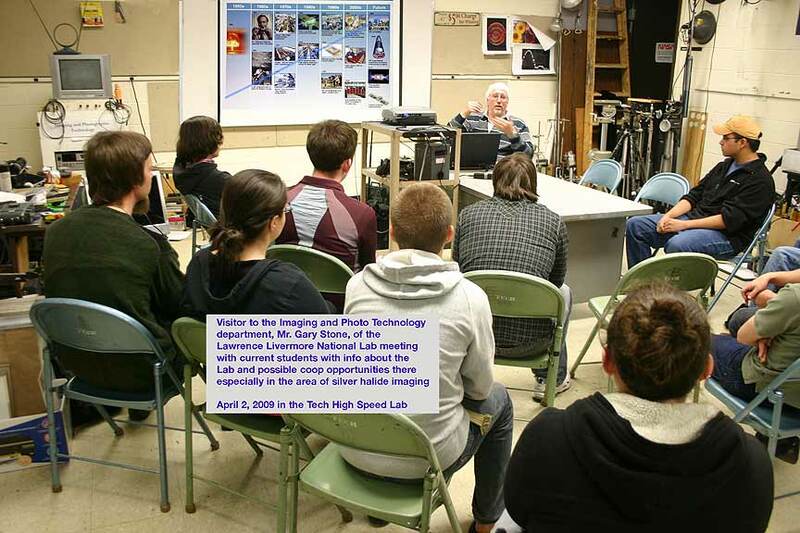 Supported by a grant from Professor Emeritus Leslie Stroebel, on May 16, 2009 the Imaging and Photographic Technology department hosted 20 current students to dinner at the Shanghai restaurant. Candid photographs made at the event by passing the camera around are available as a small web gallery by clicking here! 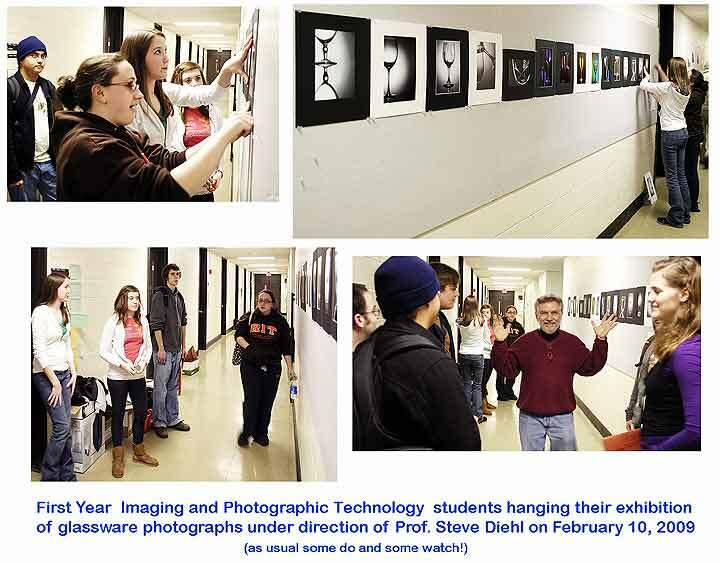 Several members of the Imaging and Photographic Technology department participated in the 2009 SPAS Faculty exhibition. Photographs by Profs. 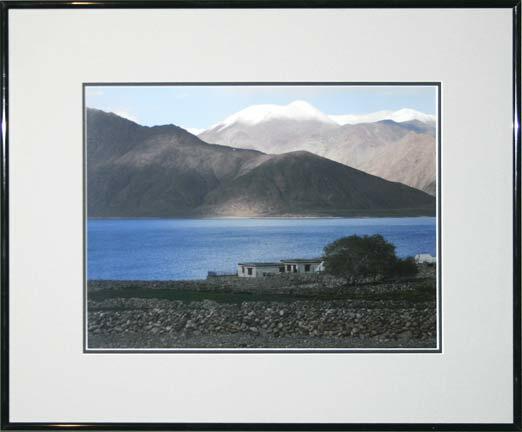 Nitin Sampat, Glenn Miller, Paul Schwartz, Steve Diehl and Andrew Davidhazy were part of the annual exhibition by members of the School of Photographic Arts and Sciences faculty. Cliuck on the thumbnails images to see them larger! Caren (Firsty) Friedman was selected as the recipient of the 2009 CIAS Women's Career Achievement Award at RIT on April 27th and while she was visiting the school she also me with students in a class and several joined her for dinner. 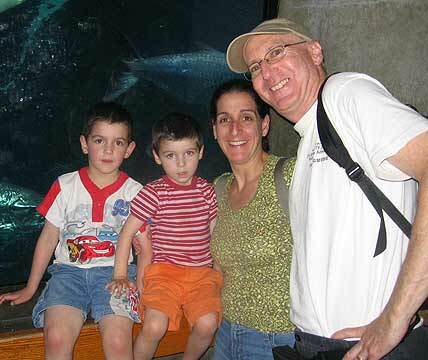 Caren was with Polaroid, Intel and Boston Scientific and is currently starting up a consulting operation to allow her to stay connected with the field of imaging while at the same time being able to spend more time with her 4 and 6 year old boys and her husband. Eric Evans, Bryan Zaczek, Aly Artusio-Glimpose and Ross Dason ran an experiment they proposed to NASA at Johnson Space Center in Houston, TX on the (in)famous Vomit Comet. Their experiment was a follow-up on the one proposed and flown by another team of Tech students last year. 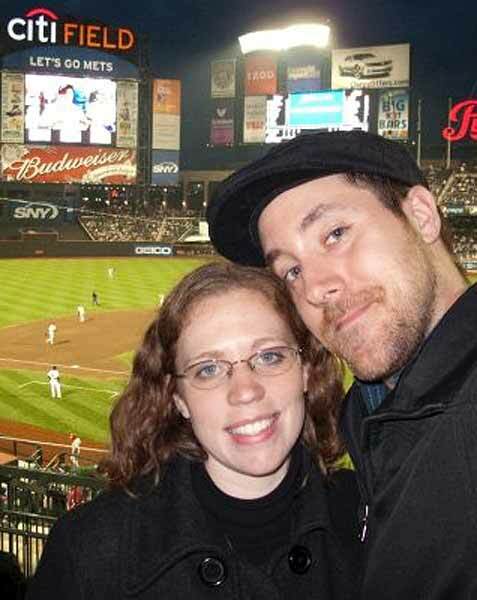 Their flight took place on April 3, 2009 and from what we hear it was disappointing in terms of regurgitation of food stuffs. 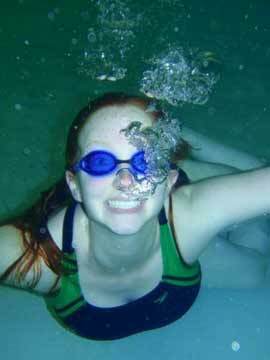 These opportunities are quite hard to come by with less than 40 schools selected each year for participation. By way of history it should be mentioned that the very first Tech team to fly on this airplane in 1997 carried Crystal (Embrey) Schroeder aloft and she was ultimately hired as a contract photographer at the Center and has photographed on the plane numerous times. 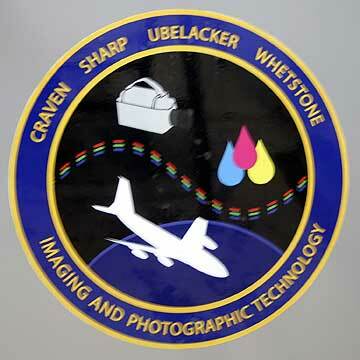 Lauren Harnett was hired last June as the latest addition to the Photo/Imaging Operations group at JSC. In fact, there is a whole slew of Tech grads working there in various capacities! 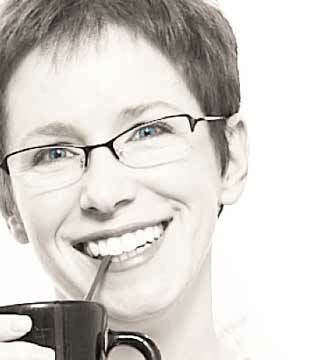 Pilar Martinez sent in a brief update on her whereabouts: She said: Hola Andy.... Tanto tanto tiempo.... Simplemente tu nombre poped up and thought it was about time to say HI!!!! Como va todo en la ciudad gris? Yo estoy finalmente de regreso en Argentina. Desde fines del 2006. 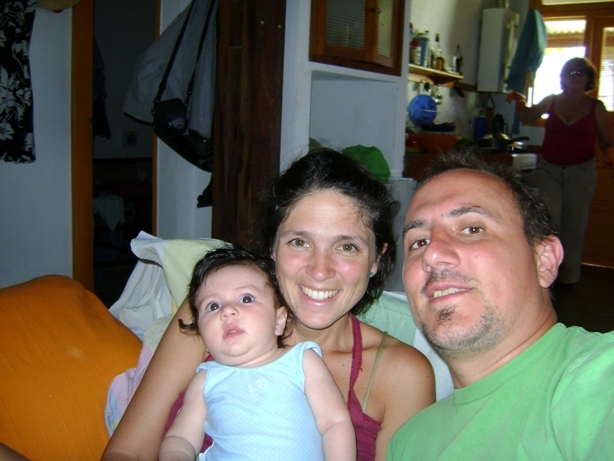 Si.... dicen que todo vuelve, y yo no fui excepcion... Te cuento que tengo una bebe de 7 meses, Malena... es la cosita mas hermosa..... y bueno.... la cosita que mas trabajo me da!!!! Espero que todos se encuentren bien. Te mando un gran abrazo y saluditos desde este lugar recondito!!! So did you get it? How is your spanish?!! 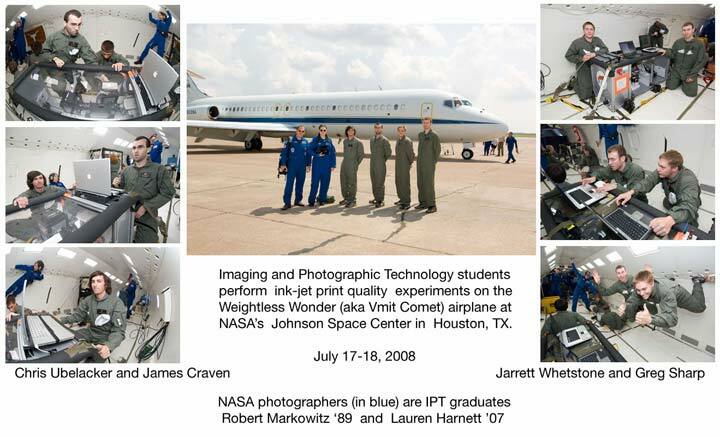 Towards the end of March, 2009 the 2009 team of 4 Imaging and Photographic Technology students selected to fly an experiment on the inFamous NASA Vomit Comet gor a tour of the Johnson Space Center escorted by Paul Reichert, a Tech grad from some time ago. 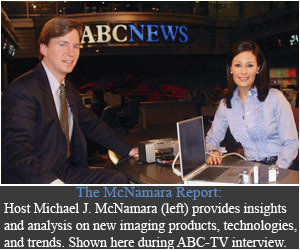 On April 2, 2009 the deparetment was host to Mr. Gary Stone from the Lawrence Livermore National Laboratories in California. 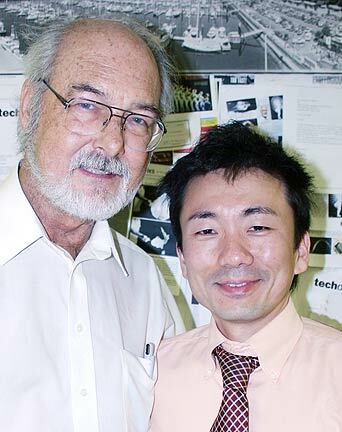 His ultimate purpose was to reestablish tioes to the department and epxlore possibilities for Tech students to coop at the lab particularly using their photographic sensitometry and photographic chemistry backgorunds. A new team of four Imaging and Photographic Technology students is scheduled to fly and conduct experiments on the NASA Weightless Wonder (aka Vomit Comet) at NASA Johnson Space Center in Houston later in March 2009. As part of the project they have to share their plans or experiences with local students. Here Jarret (who flew on the last round) and Bryan, Eric and Aly are visiting a science fair that was held at a nearby elementary school. 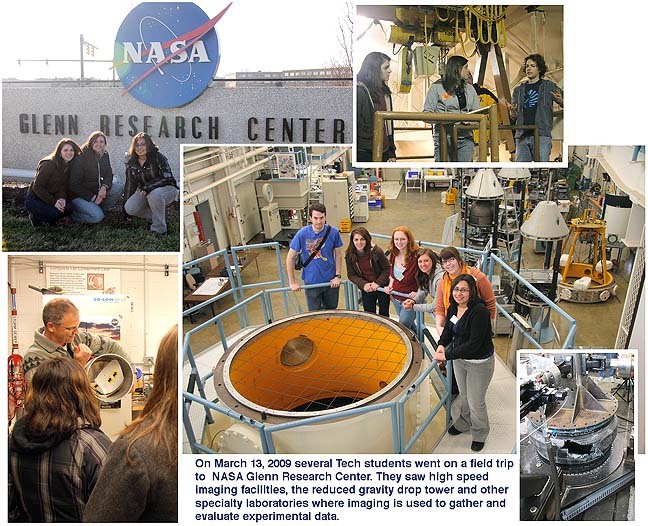 On March 13, 2009 several Imaging and Photographic Technology students went on a field trip to visit NASA Glenn Research Center in Cleveland, OH where they got to see various high tech labs and experiments that depend on imaging technologies for data acquisition and performance evaluation. This was a unique experience and particularly made possible by the good reputation the program enjoys at the Center. 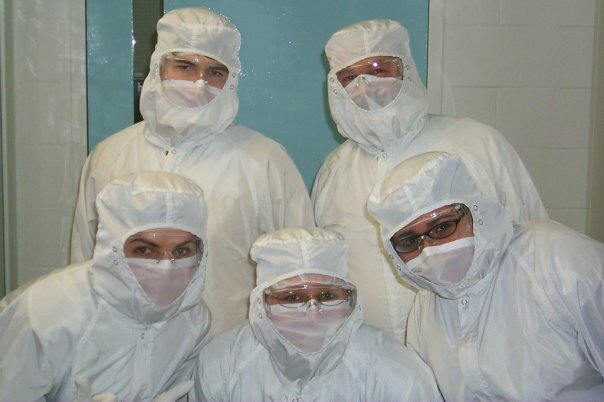 Imaging and Photographic Technology students in the winter 2008-9 Photographic Chemistry Class suited up for a visit to Eastman Kodak's Image Sensor Fabrication Production facility. Charge coupled devices are made there for a variety of imaging products including machine vision, satellite imaging and larger format professional/commercial sensors for Phase 1 and Hasselblad digital backs. We saw how chemical vapor deposition, photolithography and chemical etch processes connect to make these image sensors, as well as the testing and quality systems used. As usual to see a larger version of the thumbnail image on the left ... click on it! 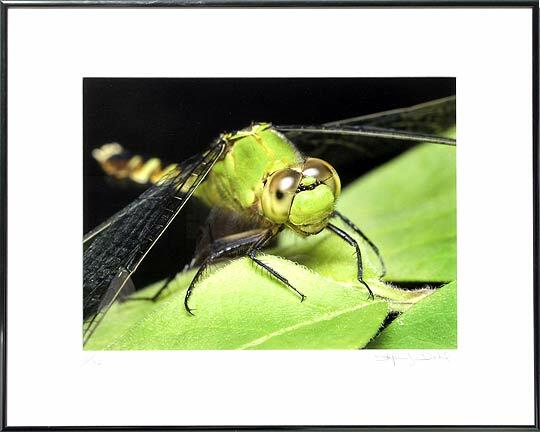 If you want to see the images as part of an online gallery and in a larger version you can follow the following link to: GLASSWARE ASSIGNMENT GALLERY. 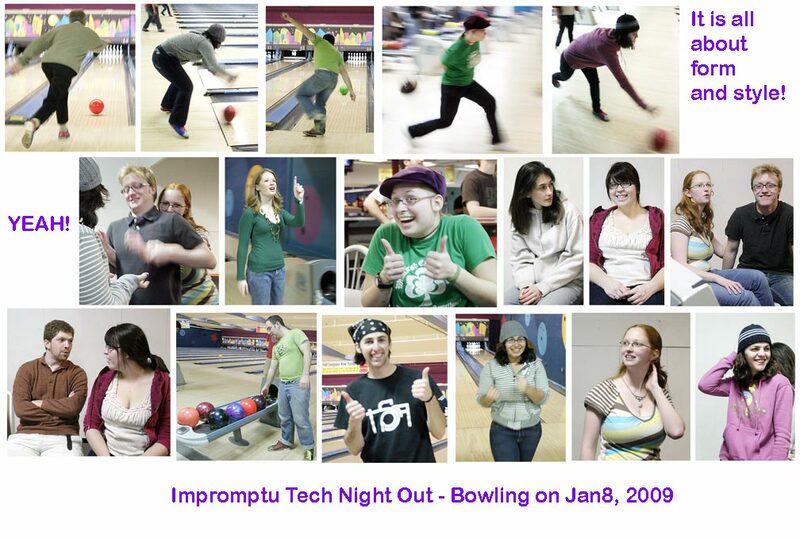 On January 8, 2009 several Imaging and Photographic Technology students and friends went out on a bowling party to a nearby alley. As you can see from the photographs it was a time to show off all kinds of characteristic Tech attributes, from interesting fashion statements and impressive and astonishing bowling form and style being some among them. As usual to see a larger version of the thumbnail image on the right ... click on it! If you want to see the images in a larger version you can follow the link to: January Bowling Gallery. Thanks to Chelsea for taking the initiative on organizing this outing! 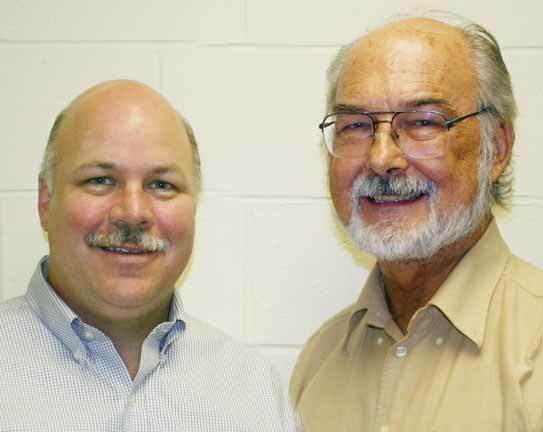 On January 1, 2009 Bruce Butkus and Kristin came up from Philadelphia and met up with Carl Smith and Collin Becker and went to lunch at the "new" nearby pub in the B&N complex. These are all gadget freaks and so most of the conversation revolved around the latest and greatest or not so hot device from computer peripherals, to cameras and cars. Carl is working on his MS degree, Collin is working at Industrial Color Labs in Syracuse and Bruce is a resource at Edmund Optics especially when it comes to color issues. 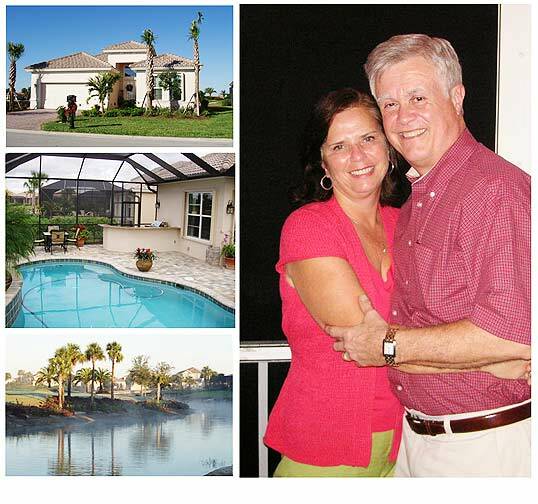 Another bit of news from Bruce and Kristin is that they bought a house. Congratulations y'all!! 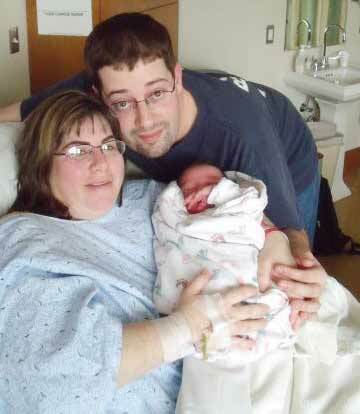 Crystal, best wishes to you and your baby from all of us in snowy Rochester! Imaging and Photo Tech students late Fall 2008 dinner out! All kinds of news from grads around the country! Of course there is this new YouTube video of the 4 Imaging and Photographic Technology students flying on the NASA microgravity airplane, aka Weightless Wonder. Although not quite seen in detail if you concentrate on what is going on you may catch a glimpse of the reason the airplane is more commonly called the "Vomit Comet". Chris Ubelacker, Jarret Whetstone, Greg Sharp and James Craven proposed a projet for the NASA Microgravity program run out of Johnson Space Center to give students an opportunity to fly their experiments on the Weightless Wonder DC-9 aircraft (aka Vomit Comet). NASA accepted their proposal and the group flew on the plane last July. Markiyan Lylak dropped in in November 10, 2008 to bring us up to date on his activities. 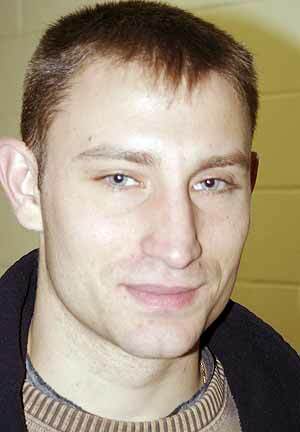 He is now employed full-time by the Ridge Road Fire District in Greece, NY. All along he was interested in becoming a firefighter and it seems his dream has been realized. He also said he plans on continuing his education if the area of fire fighting. He rattled off a variety of topics related to curses of study in this area and we wish him the best for success. He reminded us to change the batteries in our smoke detectors! 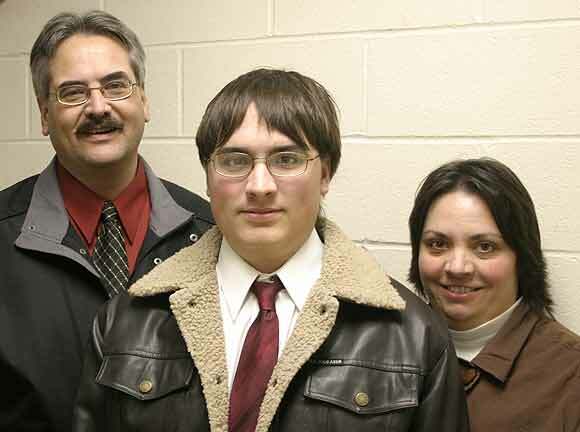 And on December 13th, the Lesnewski family dropped for a very brief "hello" as they were on their way to an interview for their son Benjamin who is applying to an RIT program. Kevin also is now vice president of marketing for Patheon, a company with headquarters in Mississagua, Ontario, Canada. 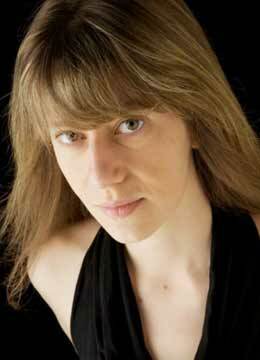 Recently we heard from Caren (Firsty) Friedman. 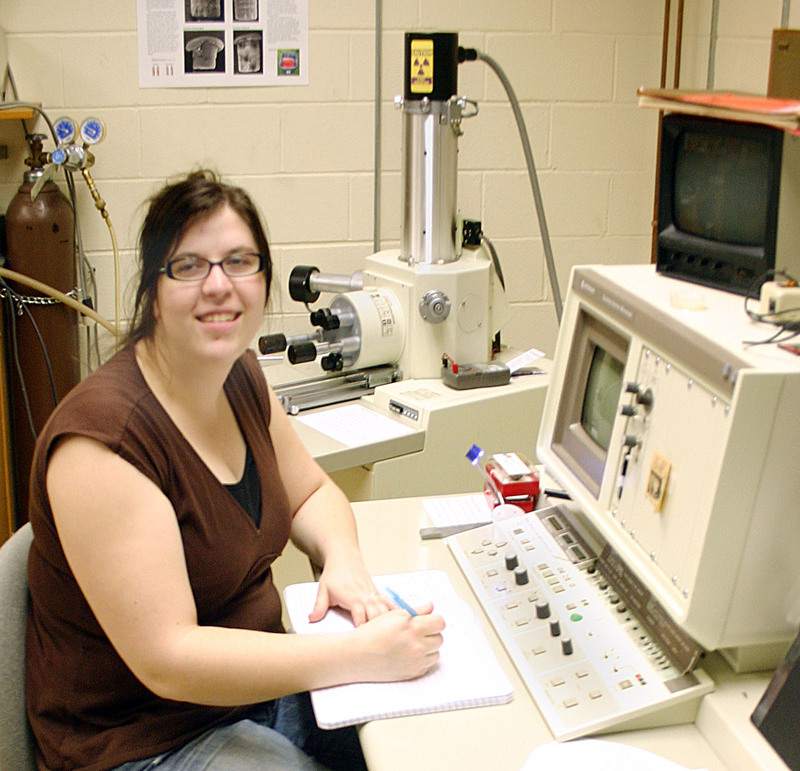 She is doing well and prospering in the Boston area and is now Imaging Scientist with Boston Scientific. She says she has attended and helped out with several RIT events held in the Boston area and comments that it is strange that she finds herself talking now mostly to parents instead of possible future students. Maybe it is related to the fact that a few years have passed since Caren graduated? 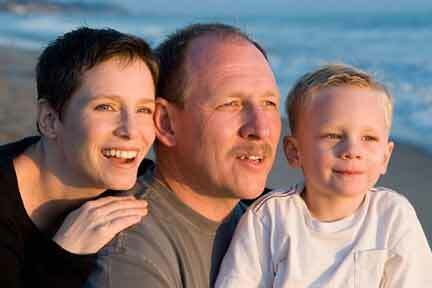 As you can see from the photograph of her family she sent things look peachy-keen for Caren!! 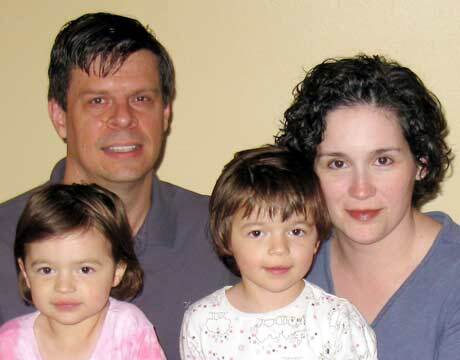 Ivan Latanision sent a brief note to share developments in his professional and family life. He said: "Here is a brief update on developments at home. I am now VP Product Management at INTTRA. It's an e-commerce company for ocean shipping. We are owned by Maersk, MSC, Hapag Lloyd, Hamburg Sud, CMA and UASC (you probably see their containers driving down the highway). We initiate over 10% of all global container shipments on our systems. Big change of career and industry - I had enough of IT and media. Lots to learn but it's really interesting. We have a son now - Ian. He's 8 months old and doing well. Our daughter Zoe is 3 yrs 8 months (birthdays are one day apart). 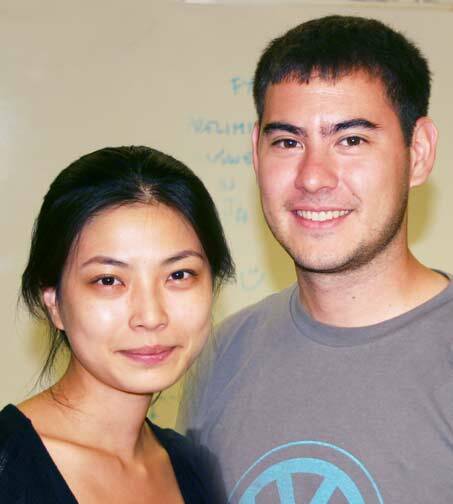 Ivan and Stacey "
Another example of the adaptability of IPT graduates! Some things don't need words and a picture speaks volumes. 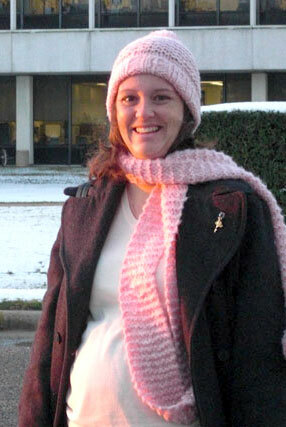 That is the case with Crystal Schroeder and you can guess what the happy young lady wearing a pink scarf and hat is awaiting!! On October 8, 2008 representatives of the Vision Research Corporation, gave a presentation to the students in the High Speed/Time Lapse photography course. 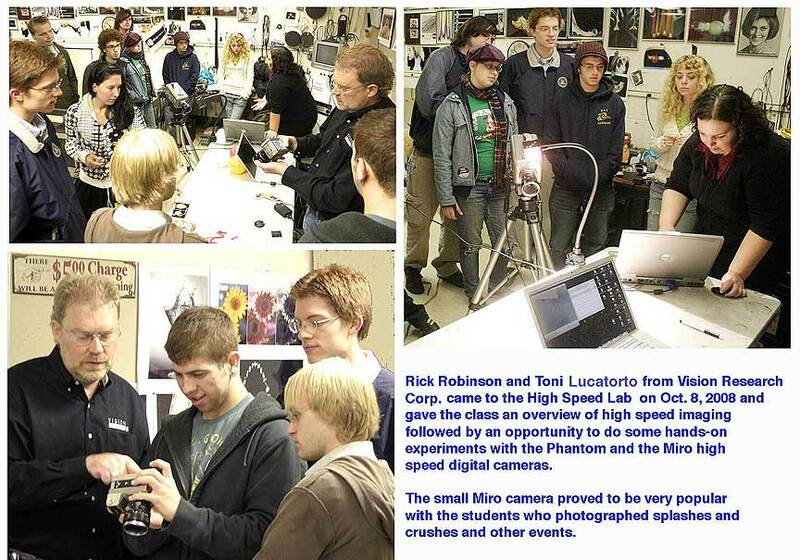 Mr. Rick Robinson and his assistant Toni started the meeting with an overview of high speed imaging technology followed by a an opportunity for the students to "play" with latest Phantom-V camera capable of 1,000,000 pictures per second (granted not each very big!) and the Miro, a highly user friendly and hand-holdable camera that they brought along with them for the occasion. The students were particularly taken with the small, portable, Miro camera and photographed a variety of subjects including a soda can crushed by the impact of a hammer. 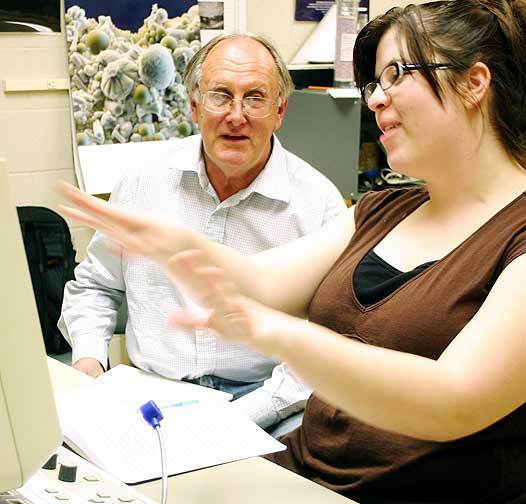 From high speed imaging like this students are tasked with quantitative analysis of their records and with determining the velocity of some part of the subject of their movies. Early in October 2008 news arrived that Anita Bauer became Anita North as follows:" We got hitched on June 14th, Patrick is alumni from Computer Science and is working on his master in Imaging Science online. Several attendees at the wedding were RIT alumni. 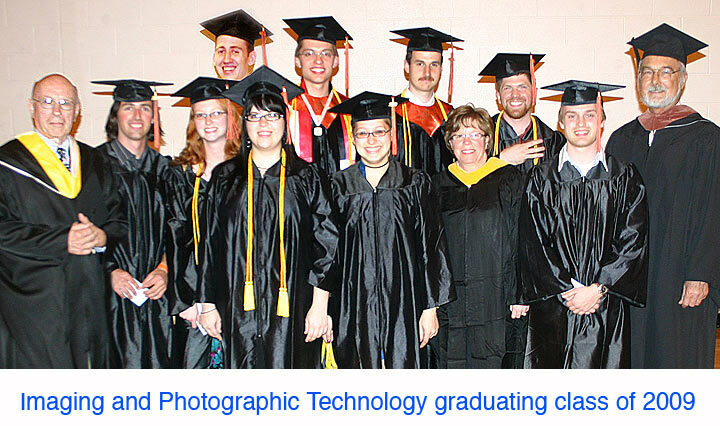 Three grads from Imaging and Photo Technology: Nicole Marousek, Kristen Weghorst, and Garret Vanderover. We had an absolute blast!!! We are very happy". Can't get much better news than this! CONGRATULATIONS! Jeff Detrick dropped in on his way back to Indiana. He says he has not been in his regular office at Delphi Automotive in Kokomo for long as he is on "travel assignments" for much of the time. Mostly in Mexico and he has picked up a few words of Spanish. Jeff is involved with color, color specification and characterization especially of paints these days. Big problems that face the company include having to go to water based paints instead of solvent based ones. We believe he still has the opportunity to catch a glimpse of future models of the latest "hot" cars. Mike Caputo and his family dropped in during Brick City on the weekend of October 11, 2008 and in addition to coming for homecoming activities they toured their older son around campus as he is looking into Computer Science or Computer Engineering as a potential career path in the future. 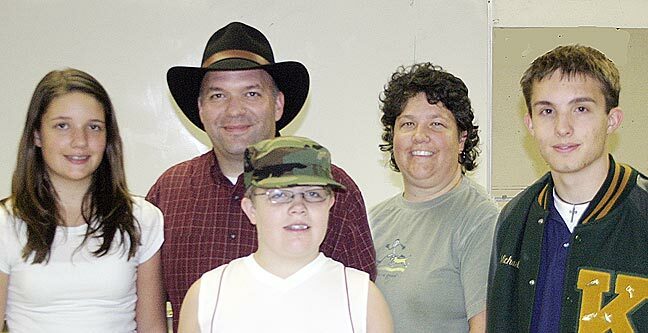 Along with Mike are his wife Karen, daughter Brittany, younger son Chris and older son Michael. It is hard to think about the fact that it seems lie only yesterday that the :gang" of c. 1987 was here terrorizing the tech faculty!! You all done good!! On October 1, 2008 representatives of the Olympus Corporation's High Speed Video Division, gave a presentation to the students in the High Speed/Time Lapse photography course. 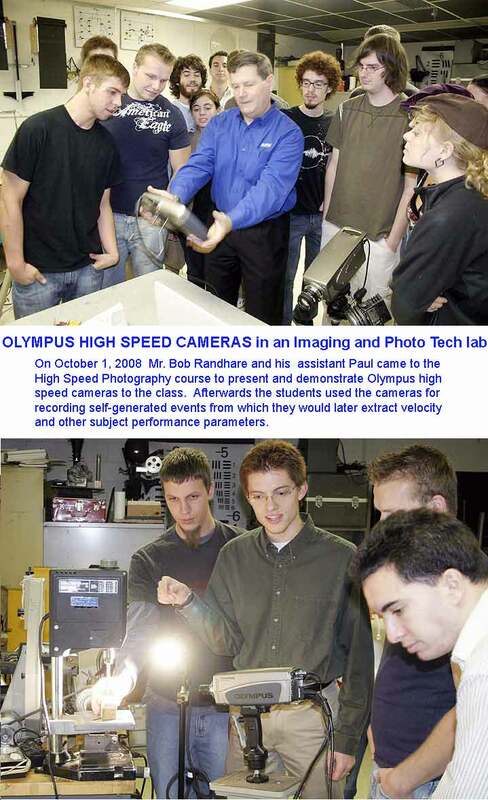 Mr. Robert Randhare and his assistant Paul started the meeting with an overview of high speed imaging technology followed by a an opportunity for the students to "play" with two Olympus "i-SPEED cameras that they brought along with them for the occasion. The ultimate capability of the cameras was not really tested by the students who used them at up to 5,000 frames per second and exposure times of 1/20,000 second while the cameras are able to go much faster and deliver much shorter exposure times. Firecrackers, focal plane shutters, high speed drills drilling into wood blocks, the blink of an eye and a rat trap destroying a small water balloon were some of the subjects photographed and destined for later analysis by the students. All in all everyone learned about the i-SPEED cameras and had FUN in the process. 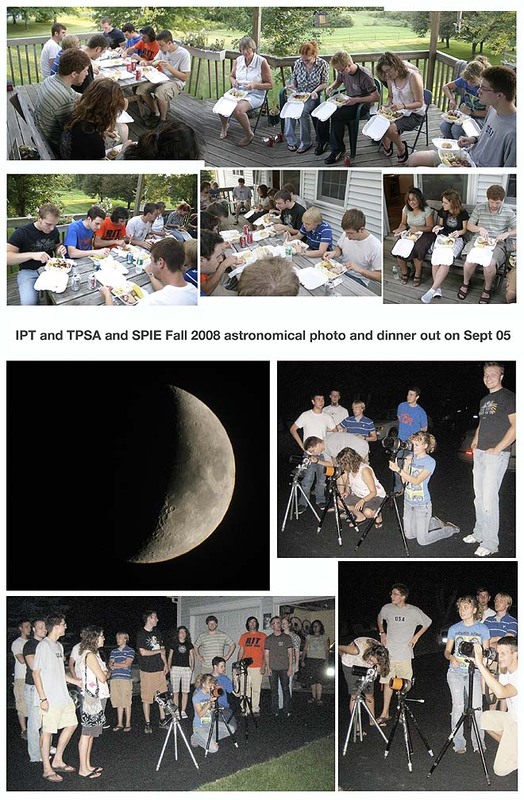 On September 26, 2008 the Technical Photography Student Association in conjunction with the Student Chapter of SPIE (the International Society for Optical Engineering) held their second meeting of the Fall quarter. The meeting's main purpose was to share experiences with the group by students who had just completed a period of coop employment this past summer or earlier. 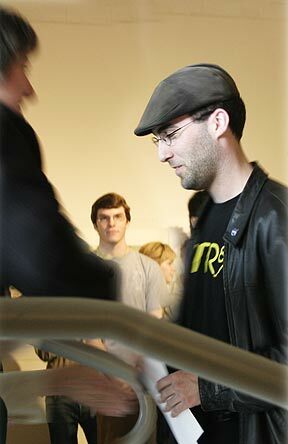 Brian Elder was presenting at the time these photographs were made. 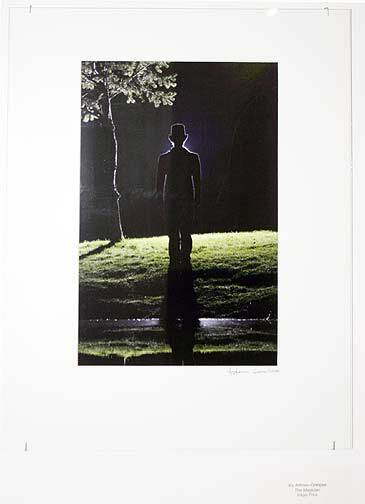 He interned at a golfing magazine near his home and did extensive photography fro the magazine. Chris Ubelacker said he had spent the summer working at Aberdeen Proving Grounds in MD doing much high speed photography. Eric Kerby and Chelsea McCulley spoke about their coop with the FBI where they did lens testing. 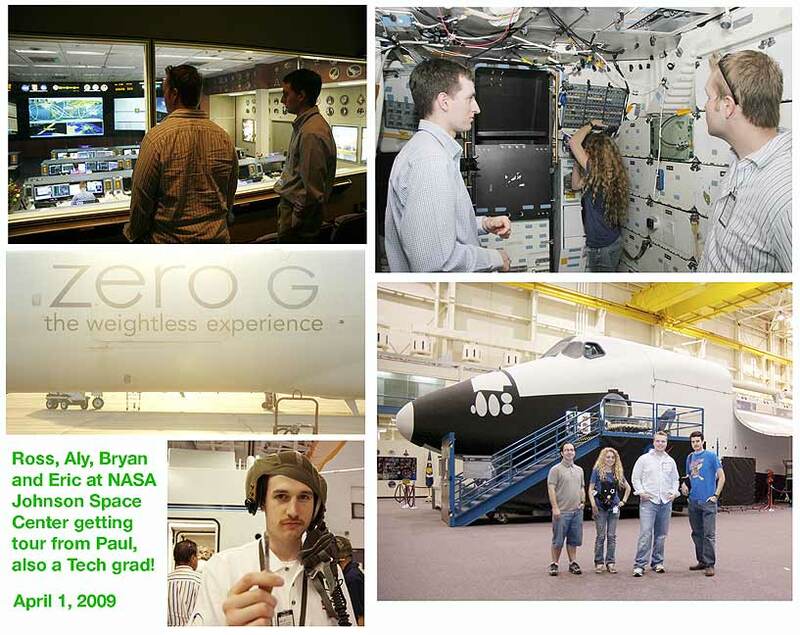 Eric Kerby also related his experience from the previous summer when he worked at NASA's Langley Research Center. Eric Evans told of his coop at NASA's Langley Research Center and an earlier coop with NuKote in Rochester and also told of his experience attending the recent SPIE Annual Convention in San Diego with expenses covered by SPIE. Jessica Scott described her coop with the Image Permanence Institute right down the hall from Tech Alley where she is still working part-time. All in all a VERY informative meeting. The diversity of activities secured and undertaken by Tech students was truly impressive to hear! Gary VanDeMortel sent this brief update as both he an Joy (also a Tech grad) are now relocated t the Washington, DC area. He says: Joy is with ITT Space Systems Division (Washington Engineering Center) here in Washington, DC now. She was with Kodak in Rochester previously. I am now with ATK Spacecraft Systems in Beltsville, MD as Pricing Manager for the division. I was with Orbital Sciences Corporation previously. 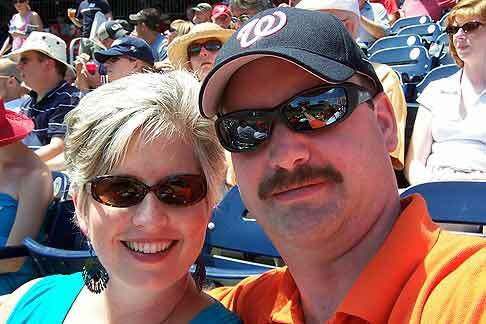 Here is a picture of Joy and I at the Nationals game. It was an RIT Alumni event. Please let us know if you come to the DC area either for business or pleasure!! You always have a place to stay!! 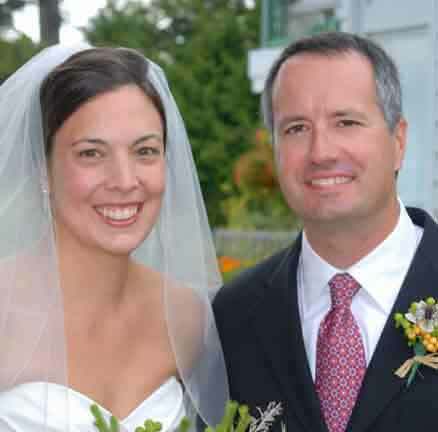 Gary"
While we don't have specific information from Michelle Hill we garner from her Facebook page that she recently married and the marriage took place on Mount Rainier. As far as we know she is working at Microsoft in the Seattle area. Hers is the first marriage that we know of that took place at such a picturesque alpine location and elevation. 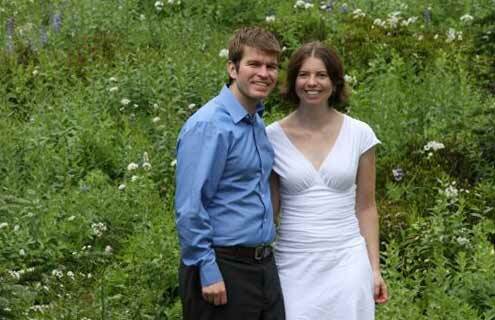 While she was surrounded by a wild flowers they were no competition to Michelle. Don't you think? Congratulations to the happy couple! 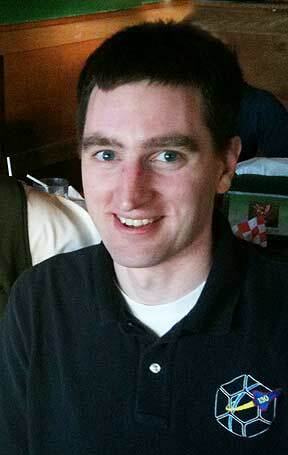 And while we don't have a photograph from the rest of the grads who sent in material here are some of the text items that arrived recently: Jeff Detrick (with Delphi) says : "I am hardly ever at my home anymore. Currently i'm spending close to 160 days a year on travel and currently have logged up 130,000 flyer miles to date. Im actually writing you at the airport in Austin TX (at least I made it out before Ike hits.) I was in Mexico the last few weeks working on a new VW program and a new painting process. I'm hoping I can make it Rochester sometime this fall to see the campus and also find out if you got the Spectrophotometer up and working. 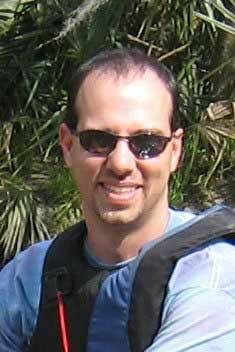 Take care, Jeff Detrick"
And from Bianca Koscielski who is in Washington, DC area as well: "I'm now a year at the National Institutes of Health/ National Institute of Allergy and Infectious Diseases in Bethesda, MD as a Web Application User Interface Specialist - who knew? I sucked so bad at Visual Basic courses freshman and sophomore year. Anthony and Kristen had to help me get through it! And now, just the other day, we have this "ancient" VB application project that needed eradicating and redesign overhaul because it could only be viewed on one computer in the whole office; it's so obscure. ha! Also, last month, my high school sweetheart boyfriend and I brought home a new baby puppy! We're very proud faux parents. We've never had dogs growing up despite us always wanting one, so to heck with it, we were ready now. He's our practice child ;) He's a 3 month old Goldendoodle (75% standard poodle, 25% golden retriever). His temperament is just awesome. He's smart, cute and sweet. 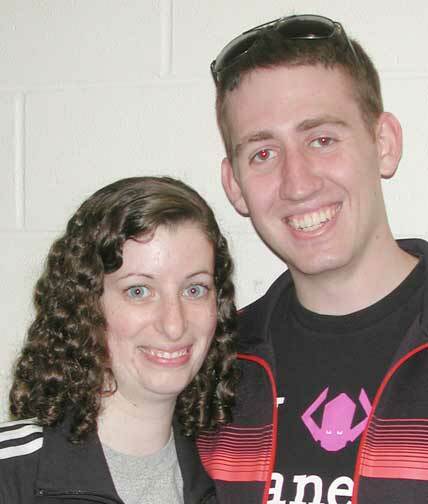 Not much to brag about compared to others out there getting married and having kids, but we're very excited and happy. 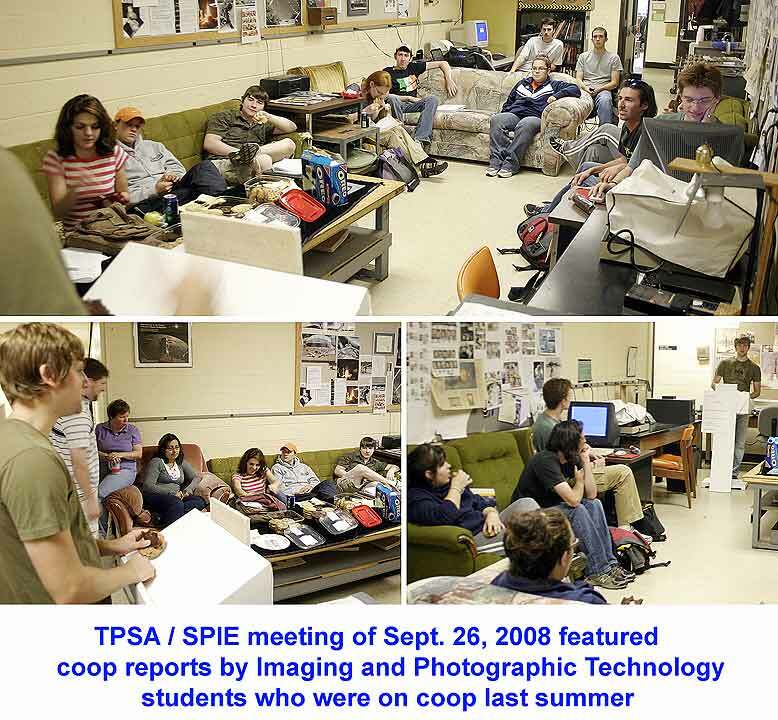 The first, or inaugural meeting, of the Techical Photgraphy Student Association (TPSA) and the joint chapter of the Society of Photo-Optical Instrumentation Engineers (SPIE) took place on September 12, 2008 in Tech Alley. The event was marked by a heated discussion related to several possibilities for activities to be undertaken by the gorup over the coming months. These include a golf put-put event, a bowling night, field trip to NASA Glenn Research Center, field trip to witness and photograph close-up the launch of the next Shuttle at KSC, running the Annual SPAS auction, bulding a TPSA kite camera, etc. The photograph here can be seen larger if you click on it. Congratulations to the officers and club members for a superior meeting. The pizza was not bad either! Fading Vintage Tech photographs of grads now forever archived! Recently in a fit to organize the bulletin board outside office 07B-2244 a bunch of "vintage" photographs (a couple dating back to 1987 and another to 2001) were taken down (finally) from the board and archived in a desk drawer probably never to again be seen by human eyes! 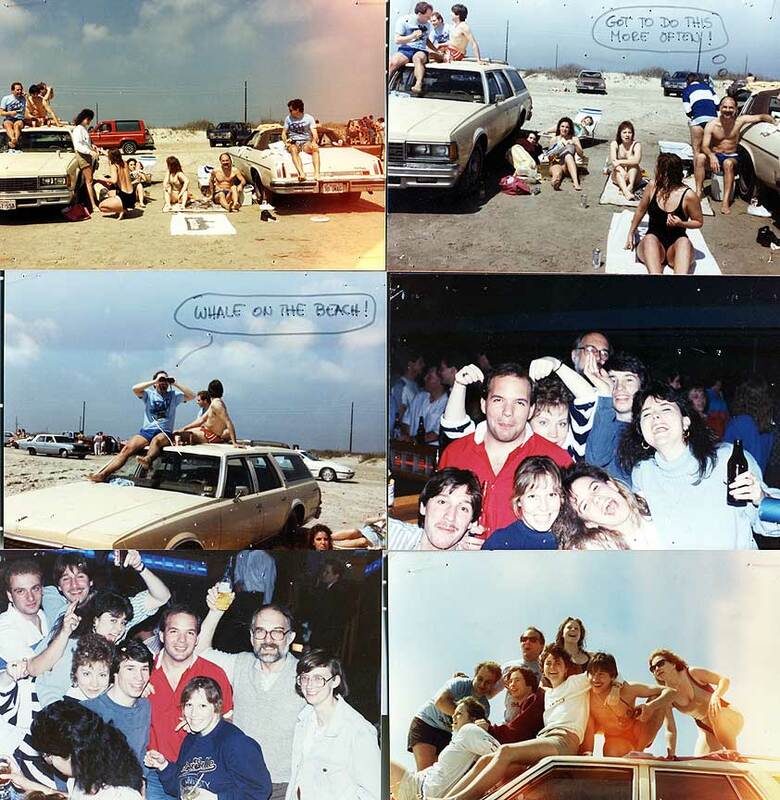 So the photographs shown here are the photonic records of those fun times we had in '87 on Galveston Beach, at a graduation party in 2001 and a record of an experiment recorded with a high speed camera gone slight awry. It is not the only experiment that Imaging and Photo tech graduates miscalculated slightly when it came to setting up a photographic system. It seems the "Davidhazy approach" of estimation and operating by the seat of your pants does not always work in industry! Names and exact dates are not listed to protect the innocent but if for some reason the images by themselves are a problem for anyone let me know and it shall be taken down immediately. On the other hand I hope they do strike a bit of sentimentality and bring back memories of good times to all. You all are the source of many happy memories for me for sure! 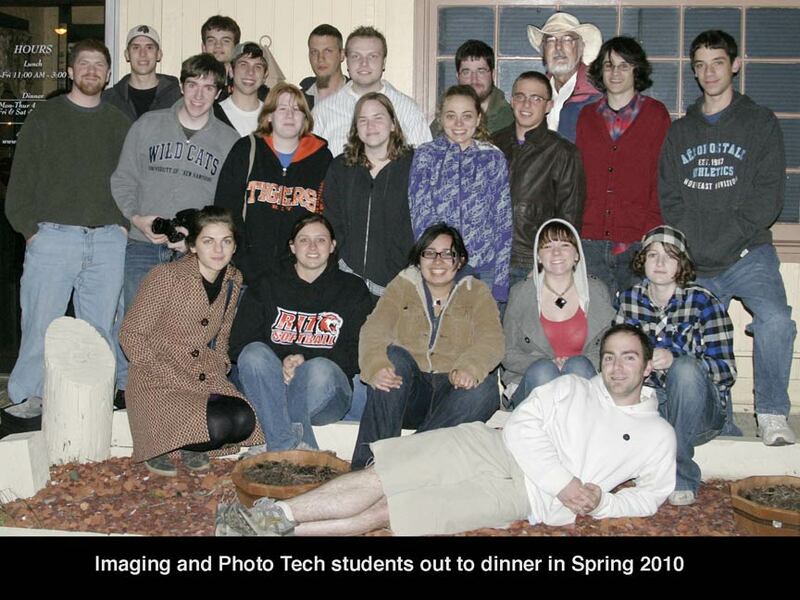 On Sept. 5, 2008 these 15 Imaging and Photographic Technology students (mostly upperclass since apparently the frosh are still shy!) congregated under the umbrella of the Technical Photography Student Association and the joint chapter of the Society for Photo-Optical Instrumentation Engineers at the home of Andy Davidhazy and after feasting on a dinner of roast pork, corn, salt potatoes, macaroni salad, coleslaw, a roll, brownies, soft drinks and a Klondike ice cream bar, they set up three cassegrain telescopes (a Questar and two Celestrons, each 1500 mm in focal length) and proceeded to do some sky gazing. The moon was the only object that was easily identifiable that night as there was intermittent cloud cover. As you can see Aly managed to get a pretty good shot of the gibbous moon with one of the Celestrons equipped with a Canon Digital Rebel. We all tried to locate Jupiter with its moons or Saturn with its rings but no luck that night. Maybe in the winter quarter we'll have more luck although it will be much colder then!! Around 9pm everyone departed for other destinations. Probably nobody to do homework though! Click on thumbnail to see a larger image!! Chris Ubelacker (Team Leader) and Greg Sharp, Jarrett Whetstone and James Craven (Flight Team) proposed an experiment to the NASA Reduced Gravity Flight Program and their proposal, dealing with an examination of the performance of ink-jet printers in a microgravity environment was accepted. They designed and constructed their experimental package over the Winter and Spring quarters and in July 2008 transported it to Houston where NASA engineers and scientists examined their work and ultimately approved it for flight. 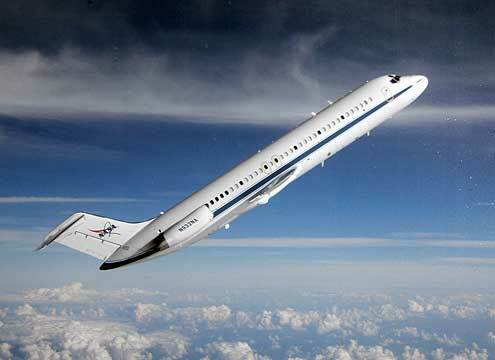 On July 17 and 18, 2008 the team flew on the C-9 airplane (aka the Vomit Comet) and conducted their experiments. Chris and James flew first and they encountered many unanticipated problems. These were fixed by the group overnight and the next day Jarrett and Greg flew with the package and acquired data that is currently being prepared by the group into a final report. 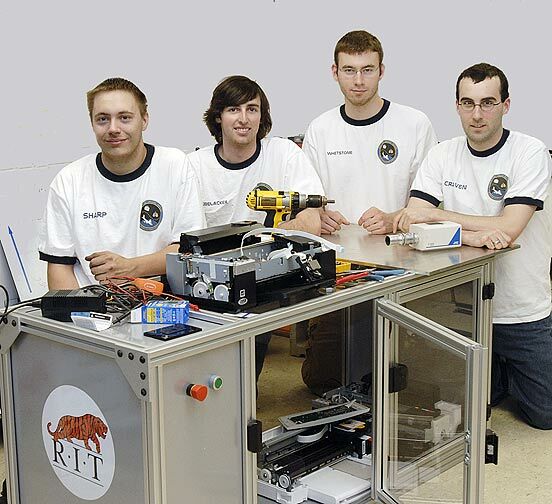 The team received support from RIT's president, Dr. Bill Destler, the IPT department and outside sources. C O N G R A T U L A T I O N S Team! 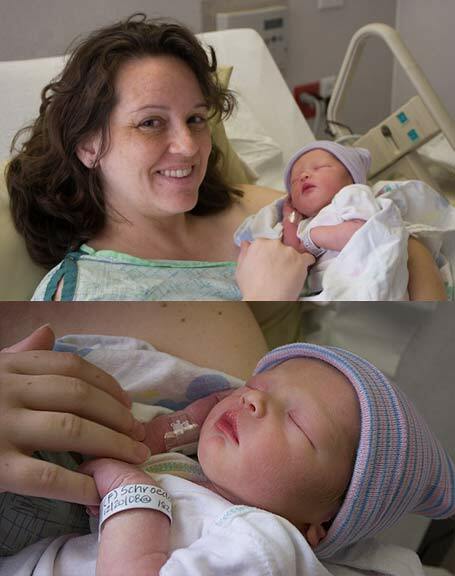 Meredith (Payne) Stotzner, sent this bit of news about developments in her life: A brief review of what we are upt othese days includes that we welcomed a daughter in January; Halcyon Elise Stotzner 1/18/2008 8lb 5oz 20.5" Like her brother, Pierce, she remains above average in the size department - so it appears she didn't inherit my little shrimpy genes. Her name is a reference to Halcyon Days - calm ocean water. We were in Hawaii when we picked it. We were looking for names that had ocean/sea in the meaning. We're all doing well. Bill and I both love Adobe. 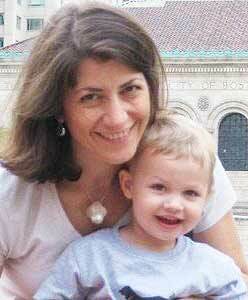 I recently returned from Maternity leave and am getting used to life with a full-time job and 2 kids. News from Tracy Kreckman: I'm still at Raytheon out here in San Diego, and I'm developing computer-based training materials for the new class of Navy destroyers called Zumwalt. 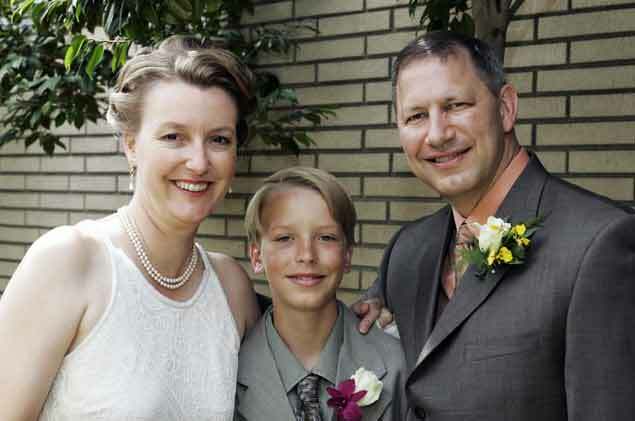 I got married last year and picked up a (now) 13 year-old stepson, Nathan, in the process, so life is pretty good right now. I just sat in on a lunchtime brief that was really interesting, and thought I'd pass it along. It was presented by Janet Shields of the Atmospheric Optics Group of the UCSD Scripps Oceanography Institute. They've put together a system to view a wide-field image along with a simultaneous high-mag view using a beam splitter and microscope optics. Raytheon Technical Services Company LLC. Recently Emily Antoine who is working in the Washington, DC area, stopped by Tech Alley to say hello and to comment in very general terms about her life there. She is doing well and loves her job. She also works with several other grads of the Tech program and sees Lindsay, who is still rowing, Sarah and Scott on a regular basis. Elizabeth Martin also dropped in to Tech Alley for a short visit to pass the time while her friend was doing some business in Rochester. Guess what? She brought along her newly adopted dog all the way from the west coast. Cute little animal. It mostly liked to snuggle in Elizabeth's lap. You could tell she treats him like a king! Anyway, we spent a few hours together, had lunch at DiBella's and she related how happy she was for making the move to Califirnia and joining Micron Technology. This company is in the process of starting what I believe is a "spin-off" company called Aptima and she is excited about this move as well as it will give her more responsibility and opportunities to make a difference. She is a Camera Characterization Engineer for the company and is located, where would you guess?, in San Jose, California in the heart of Silicon Valley. On July 7m 2008 Bret Harmen and family stopped by the 2nd floor of SPAS, more specifically to Tech Alley, with the purpose of meeting some of the faculty members. Unfortunately they only ran into one of them! Everything is going well for Bret and he mentioned that Jacob is a great little baby. Here is the grad group with some nostalgia photos - their RIT ID photos! 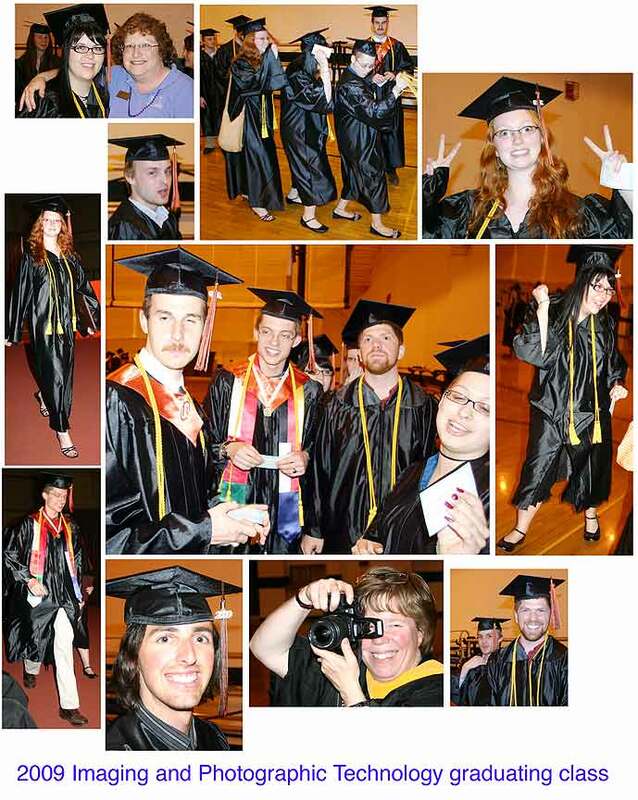 Imaging and Photo Technology Graduates Celebrate! 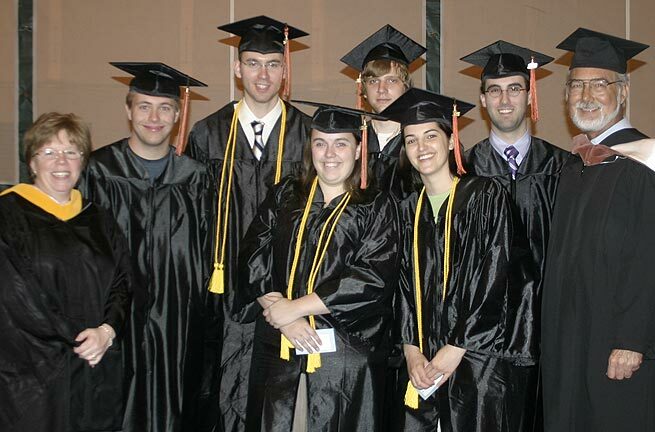 On May 24, 2008 the it was graduation day and several members of the senior class attended the graduation ceremonies. 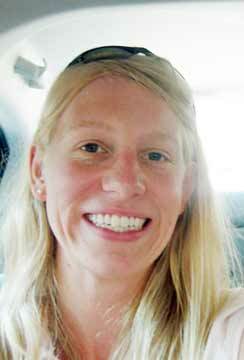 Among them were Elise Hubbard, Brian Elder, James Craven, Jarett Whetstone, Gillian Kovalcik and Greg Sharp. This was the smallest graduating class in several years but what they lacked in numbers they sure made up in terms of quality. Full time employment and graduate school are a certainty for some and objectives for others of these outstanding Tech grads from 2008. C O N G R A T U L A T I O N S T E C H G R A D U A T E S ! 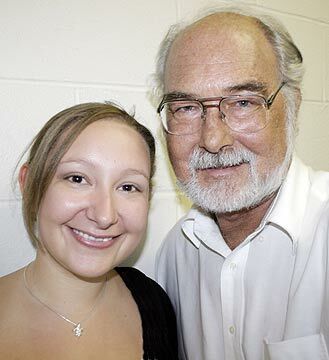 On May 16, 2008 the annual SPAS Honors Show opened in the Photo Gallery and the work of several IPT students was accepted for inclusion in this prestigious end-of-year exhibition. 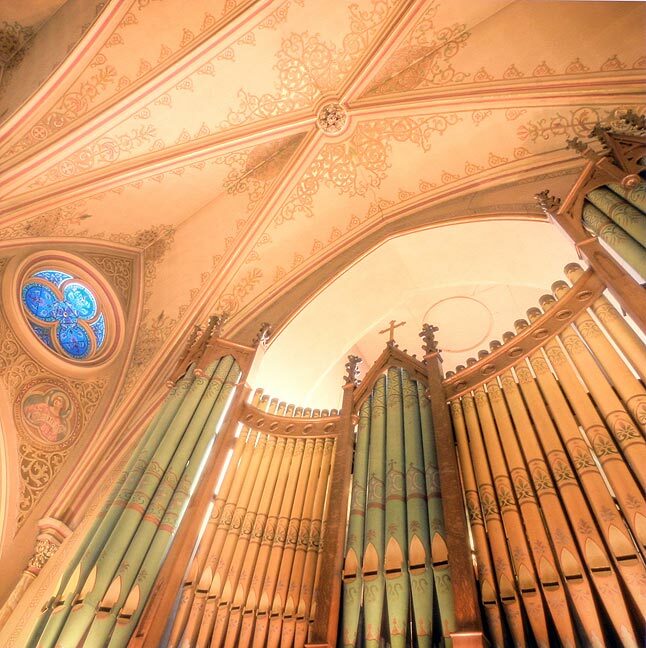 On the left, "The Magician" a photograph by Aly Artusio-Glimpse and on the right "SAU Quad Polar Pano", an assembly by James Craven can be seen. Larger if you click on them! 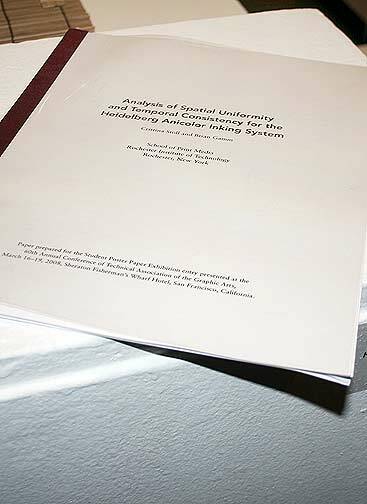 Also a collaborative lab report by Brian Gamm on "Analysis of Spatial Uniformity and Temporal Consistency for the Heidelberg Anicolor Inking System" was on display. 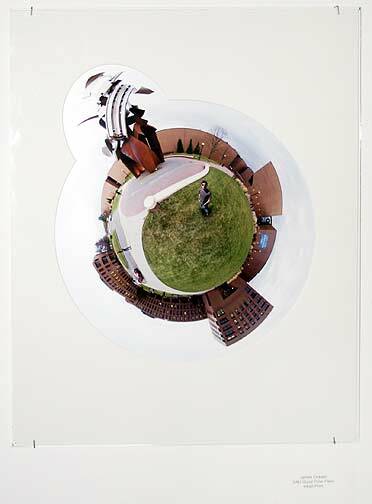 James Craven's photography, in addition, was the recipient of two purchase awards totaling $300. C O N G R A T U L A T I O N S T E C H S ! 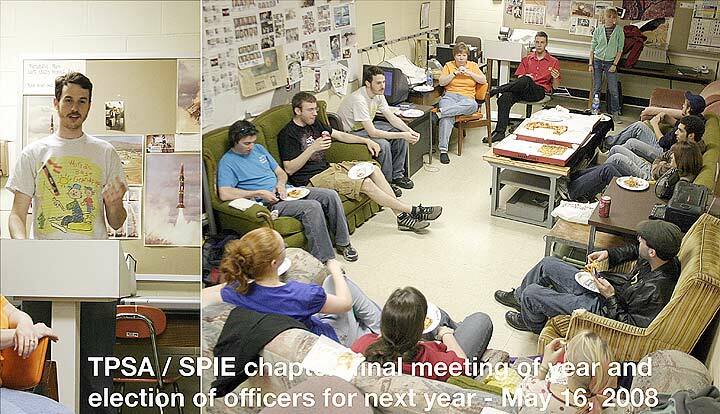 On May 16, 2008 the Technical Photography Student Association and the joint students chapter of SPIE met to hold year-end election of officers for the coming year. Eric Evans the current president even managed to scrounge up a podium and a gavel to presidentially conduct the business of the day. Accompanied by the smell of fresh pizza the proceeding proceeded almost without a hitch. The new officers for the coming year include: Eric Evans as the returning president, Brian Zaczek as Treasurer, Jessica Scott as secretary and Bert Crawford as vice-president. 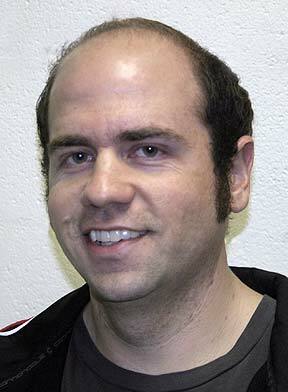 There is also a TPSA webmaster and he is Eric Kirby. Best wishes to these new officers and make sure you let your desires and interests for activities during the coming year known. Without your guidance they will be floundering in the dark. CONGRATULATIONS!! To add news to this Departmental News Bulletin Board send text and attached images to: Andrew Davidhazy who will gladly add the item to this bulletin board dedicated to the students and faculty of the Imaging and Photgraphic Technology program at RIT's School of Photographic Arts and Sciences.